As I was researching food storage today, I came across the Department of Nutrition, Dietetics, & Food Science at Brigham Young University. They do research on Food Storage. 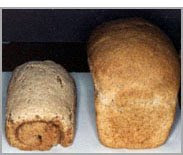 Check out the picture of a loaf of bread above made from 20 year old wheat stored in a garage versus a cool basement. Very appetizing! This picture really emphasizes the importance of storing foods under proper conditions so that shelf life is optimized. In my former California home, we built shelving on a wall in a spare bedroom so that our food storage was not in the garage where summer temperatures were 115 degrees. It wasn't exactly pretty, but now, I can see what happens when we don't store under proper conditions. My kitchen cabinets were full of canned foods too. To my California friends: store in the house so that the heat of the garage doesn't ruin your food storage! Temperature: Store products at a temperature of 75°F/24°C or lower whenever possible. If storage temperatures are higher, rotate products as needed to maintain quality. Moisture: Keep storage areas dry. It is best to keep containers off of the floor to allow for air circulation. Light: Protect cooking oil and products stored in PETE bottles from light. Insects and rodents: Protect products stored in foil pouches and PETE bottles from rodent and insect damage." So, if you have to store items at a higher temperature, make sure you are using or rotating them. They will NOT endure 30 years at higher temperatures. 1. Move items from your kitchen cupboards that you don't use often into the garage to make space for your food storage. Vases, platters, etc. 2. Store food storage under beds in bedrooms because you usually keep these areas cooler. 3. Or create some furniture. Remember the bed Jared Phelps (Kirby Heyborne) slept on in the movie the R.M? Not far from the truth. The little bedside table in this picture covered with the burgundy tablecloth is really about 60 #10 cans stacked in boxes. Doesn't look like it, but that's 348 lbs. of wheat! Who needs real furniture? I just came across your blog and love all the practical information I am gleaning from your hard work. Thank you! My husband's family (they have 10 kids!) are from Riverside and now live in Bountiful, UT! Small world, eh? His grandfather was patriarch for a long time in the CA stake. I'm having a little trouble storing all the food in my little apartment. I'm a little jealous of all your glorious storage space. I desperately need shelves in my room because food is just stacking and piling up against the wall. It's getting hard to get to things and looks very messy, but hey--the important thing is that I have it, right? ?